We cannot display this galleryTake a quick delve into the history of the Abu Dhabi Desert Challenge and there’s a few nuggets of info you might find interesting. For instance, in early 2009, the erstwhile UAE Desert Challenge was renamed the Abu Dhabi Desert Challenge as the route, which once flowed from emirate-to-emirate, became specific to the United Arab Emirates capital. It was a move that, by coincidence, tipped the scales in more ways than one. Between 2009 and the inaugural event in 1991, 13 winners were French, former Formula 1 driver Jean-Louis Schlesser proving the most successful on four wheels with five overall wins in ‘94-‘95 and ‘99-‘01, and Cyril Despres flying the Tricolour in the bike category in ‘01-03, ’05 and ’08. While Dakar legend Stéphane Peterhansel would beat his compatriots’ records in 2011 (he’d also won on two wheels in 1996), Schlesser would equal this record with his sixth win just one year later, a result that, hitherto, marks the last victory for a French competitor on the Abu Dhabi Desert Challenge. Indeed, since the name change in 2009, Marc Coma and Nani Roma have swung momentum Spain’s way with six victories, while Vladimir Vasilyev and Leonid Novitskiy have posted three for Russia. It wasn’t until Sheikh Khalid Al Qassimi crossed the line in 2017 though that several other accolades would be put to rest. 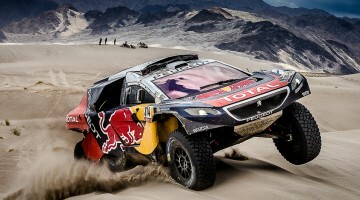 The result – in which the Emirati came home more than 4m clear of nearest rival Martin Prokop – marked not only the first win on the event for Al Qassimi but also the first for Peugeot courtesy of the Abu Dhabi Racing-entered 3008 DKR. The win was also only the third in 10 years for a local driver, Nasser Al Attiyah having done the needful in 2008 and 2016. That’s not the best bit though: quite incredibly, Khalid Al Qassimi’s victory was the first for an Emirati competitor on the Abu Dhabi Desert Challenge since Mohammed Mattar’s back-to-back non-championship wins in 1991 and 1992. Not that the Emirati had it all his own way, of course. Qatar’s Nasser Saleh Al-Attiyah seemed to be cruising to victory in the #201 Toyota Hilux until a disastrous roll on the final stage knocked him out of a 22m lead, and ultimately, contention for victory. Despite drive shaft issues hampering his first event start in the brand new #202 Peugeot 3008 DKR, the door was now open for Al Qassimi to take the win in only his fifth start in Cross-Country Rallying, the Emirati having decisively fended off an impressive charge from fellow regional favourite Mohammed Abu Issa. The Qatari, making the transition from quads to cars, was nevertheless pleased to finish third in the #209 X-Raid MINI ALL4Racing behind the Czech Republic’s Martin Prokop, who took a career-beat second aboard the #207 MP-Sports Ford F-150. 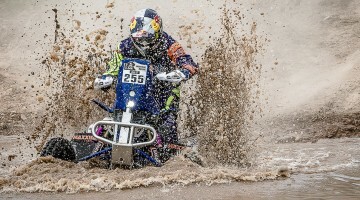 The battle for victory was taken similarly to the line in Bikes, with Portugal’s Paulo Gonçalves having amounted a 33.8s lead over 2017 Dakar Rally winner Sam Sunderland. Being first on the road through the final stage would ultimately hurt Gonçalves though, Sunderland storming through the closing stages on his KTM 450 Rally to take victory in the bikes – the 20th for KTM on the Abu Dhabi Desert Challenge – some six minutes up the road from second-placed Pablo Quintanilla. Poor luck would even see Gonçalves drop to fourth behind Austria’s Matthias Walkner come the chequered flag. Kuwaiti’s Fahad Al-Musallam meanwhile took full advantage of gearbox issues for Guatamala’s Rodolfo Schippers to take victory for Quads aboard his Yamaha Raptor 700R. Enjoy these AWESOME IMAGES from the 2017 Abu Dhabi Desert Challenge ?